(OPENPRESS) December 30, 2010 — Award-winning author/filmmaker J. Neil Schulman’s “1979 Novel Ripped from Today’s Headlines!” — Alongside Night — has just passed a quarter million downloads from http://www.alongsidenight.net. The 30th Anniversary PDF edition of Alongside Night passed 250,000 downloads on December 27, 2010. 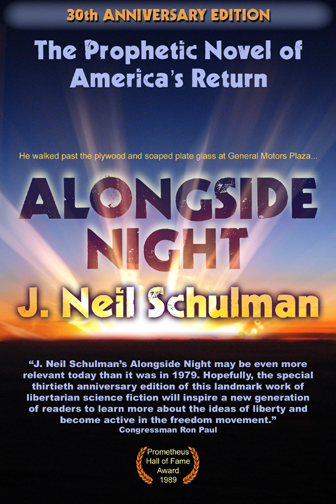 Alongside Night’s author, J. Neil Schulman, is also known for his Prometheus-Award-winning novel, The Rainbow Cadenza (Simon & Schuster, 1983), known as the screenwriter of the 1985 CBS Twilight Zone episode “Profile in Silver” in which a time-traveling future historian creates an alternate time-line by stopping the JFK assassination, is author of the Charlton Heston-endorsed nonfiction book Stopping Power: Why 70 Million Americans Own Guns, and is the author of the longest interview ever conducted with science-fiction Grandmaster Robert A. Heinlein, published in Schulman’s The Robert Heinlein Interview and Other Heinleiniana. In 2006 J. Neil Schulman wrote, produced, and directed the suspense-comedy feature film, Lady Magdalene’s, starring the original Star Trek’s Lt. Uhura, Nichelle Nichols, and the film won “Best Cutting Edge Film” at the 2008 San Diego Black Film Festival and “Audience Choice” at the 2008 Cinema City International Film Festival. The film may be streamed or downloaded from Amazon.com, where the movie’s musical soundtrack is available both as CD’s and as mp3 downloads. Its official movie website is at http://www.ladymagdalenes.com and it’s listed on IMDb. J. Neil Schulman has written a screen adaptation of Alongside Night and is in pre-production to direct it as his second feature film, starring international film and TV star Kevin Sorbo in the role of Dr. Martin Vreeland. 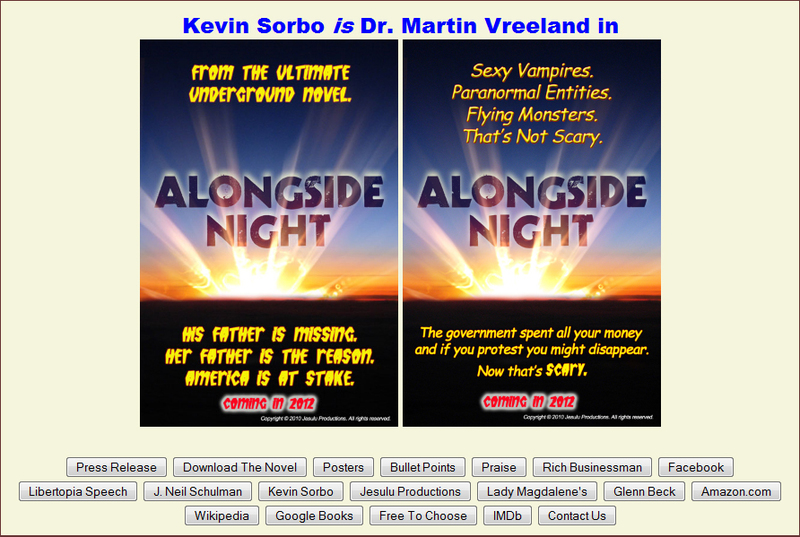 Both Schulman and Sorbo are executive producers on the production, which is listed on IMDb and its official movie website at http://www.alongsidenightmovie.com. Facebook maintains a group named Alongside Night — Book to Movie. Wikipedia maintains an article on Alongside Night. Kevin Sorbo was the star of the #1 rated worldwide TV series, Hercules: The Legendary Journeys.